Since Chiwa posted hers up on the Unicorn Forum, I figured it would be alright for me to post ours here. So, without further ado, the IC Letter to the Champion. Otosan Uchi is within our grasp. I promised you a city when last we spoke, my lord, and I have delivered two fold. East Hub Village is ours, and we have stood before the eyes of all and proclaimed the intention to rebuild and purify Otosan Uchi itself. In this, we were not denied, nor were we accepted. Undoubtedly, the fools among the Crab and the cowards among the Lion will decry any actions we take as presumptuous, even overly ambitious, but what do we care for their pathetic mewling? Let them meet us in the city broken by your father. We shall lay them low as your father did to their grandfathers. The Yotsu family have accepted our help, and within the year, Scorpion Clan will assist with separating us from the unfortunate alliance made of necessity. Let the unnamed allies feed upon the Scorpion Clan. It will pit two enemies against one another, and only the strong shall survive. Let Otosan Uchi be the crucible we forge our future in, for the glory of Daigotsu. As I speak of this future, know well that your servants have been tireless in their efforts in achieving it. I have included with this letter the treaty we brought before the dais this season, a treaty binding us in alliance with the Crane, Mantis, and Unicorn Clans, all brought together in the honor of the worthiest heir, Iweko Shibatsu. The Clans who opposed our rise stood fruitlessly against us, and even the Otomo humbled themselves by allowing the Phoenix to speak for them. I know well your desires for us to aid the struggling Otomo this season, and for that, I must speak truly. They are too proud to be a serviceable ally. They offered us little and asked for much. Above all else, they were afraid to stand as our ally, a fear the Crane Clan did not share. Let us stand with the Crane Clan for now, until the time comes that the Otomo remember us and remember how good it was before. Let the Otomo come to us hungry and desperate. We will be waiting. We are teaching them to be properly afraid. Then, we will teach them to be strong again. I am pleased as well to confirm that the Crab Clan will find us ready for their war with full bellies and many allies. We have secured more than double the food you requested of us, my Lord, and have added to it a supply of Dragon Clan hakanai, powerful alchemical items to be used in the field of war. While the Crab themselves have gained allies from the Mantis and the Phoenix, neither would move directly against us. It would seem the Crab Clan intends this war to be an honorable one, with their forces standing alone against us. Publicly, at least. Yasuki Tono proved himself to be a worthy adversary this court, hiding skillfully behind his duty as the Crab have hidden behind their Wall for generations. Their duty will not save them in the Colonies. The Gyushi family will need to be granted greater holdings soon. As per the treaties I have included, their numbers swell greatly with the marriage of a dozen shugenja each from the Dragon Clan and the Unicorn Clan. It is a task I would recommend you place Ide Doburu in charge of. Within the year, he shall be Susumu Doburu, and shall be the chief retainer of the Imperial Treasurer in the Colonies. In so doing, he has secured the position of Susumu advisers in the courts of the Dragon, Crane, Mantis, and Unicorn, a task he achieved without informing me until it was complete. He will make an excellent Spider, but one that I feel deserves a particular honor. One with many challenges. These victories were not achieved without cost, and it is these costs I feel must be honored. My first karo, Daigotsu Kurogane, was slain in a duel defending our honor against baseless slander of the Crab karo, Kasuga Aizawa. Aizawa’s hubris was duly rewarded at the end of his own blade, after his champion lost to Daigotsu Atsushi in a duel to the death. My second karo, Susumu Naishi, was last seen at a warehouse where she assisted in foiling an assassination attempt on the Voice. It is the belief of Daigotsu Geiko, my third karo, and Susumu Mizuki, her close ally, that she has been kidnapped by the Kolat. Daigotsu Mori has been sentenced to service until death on the Scorpion Wall for speaking of your father’s realm before the dais. Finally, there is the matter of Toku Saiga. Born to the Monkey, his presence in our delegation was one that brought us a great deal of glory, none greater than his last actions. By now, you have heard of the incursion by the Realm of Evil into the capital. It was a matter we had no hand in creating, but Saiga bound the spiritual incursion itself to his life, taking on the Blessing of your father to render the Oni threatening the Imperial City vulnerable with his death. It was Saiga’s deepest wish to be given fealty by the Spider Clan, and to take the name Daigotsu. For his actions, I request this be honored. Let him be remembered as Daigotsu Saiga, Paragon of Determination. Let me finish this letter in addressing the final text I have included. Penned by Daigotsu Geiko, it details at length the study of the Dark Fortunes and how they may influence the Blessing of your father’s realm. I request we continue this study, for it may prove useful in destroying our next foe. When our war with the Crab is over, we have promised our next Emperor a gift. The head of Chosai, Dark Oracle of Fire, severed by Spider steel. By your will, it shall be done. Last edited by sndwurks on Thu Feb 26, 2015 5:53 am, edited 2 times in total. Daigotsu Atsushi, the Colonial born son of a Ronin turned Spider, was trained by Daigotsu Sahara to be a duelist in service to the Susumu family. Infamous for his sharp tongue and dueling skill, use of the former lead to use of the later: After a heated argument, the Tortoise Kasuga Aizawa called for his head. After things were straightened out, the resulting duel had Atsushi face off against Aizawa's champion, Yasuki Kyoko, a Shiba trained duelist with two victories already under her belt. Atsushi's duel with the Crab ended up being the type stories are written about: a Karmic Strike followed by Atsushi's victory over his more than worthy opponent. With Kyoko's death, Aizawa soon followed, but that was not the end of things. Atsushi's confidence was shaken and Kyoko had one she loved and was loved by: Shinjo Sousuke, another duelist and a friend Atsushi had made earlier in court. In his grief, Sousuke challenged Atsushi to an illegal duel to first blood which the Unicorn won. Days later, Ide Doburu offered Atsushi the chance to study with dueling masters from the Kakita and Mirumoto and Daigotsu Katashi offered him the chance to become an Obsidian Warrior. A Spider not by birth nor choice but through coercion, Geiko's life is one of contradictions. A Taint hater within a clan which reveres it, taught to kill and manipulate without remorse yet unable to do so, a violent man and a lover of flowers, his mind constantly teared between what he must do for his clan and what he would want to do as a proper samurai, culminating in an erratic and incoherent behavior, with sudden flashes of madness, like throwing a flower at the Imperial Nakodo. Trained ruthlessly in the jungles, he was supposed to act as the shield of the delegation... Which he did badly, even ending as the Karo of it upon a pile of corpses. Indirectly responsible of the corruption of his love, he still hopes for her salvation, and walked more than once forbidden paths in search of a cure, a quest in which he dragged many people, up to the Celestial Dragon and the Voice of the Empress, who unofficially tasked him with that study. Then buried his report. He used to feel nothing but disgust for his clan members, but learned during this court that even within the Spider there are good people worth protecting. A Dragon trained Spider Bushi, Daigotsu Kurogane left his wife and young son in the colonies to attend Winter Court as a functionary for Susumu Takada. He ran the day to day operations so that Susumu Takada could focus on his projects. He also worked and worried with his father-in-law, Ide Ibiki, over the education and future of Kurogane's son, Ichiro. After accidentally insulting Emma-O, Kurogane entered into a pact with the Fortune. Should Kurogane not serve the fortune to His satisfaction, Emma-O vowed to curse Kurogane's family line for all eternity. If Kurogane should succeed, Emma-O promised to bless his descendants instead. Kurogane developed a rivalry with two Crab delegates, Kasuga Aizawa and Yasuki Aitoko after interfering with one of their clandestine investigations at a rundown inn in the capital. His rivalry with Kasuga Aizawa came to a head as Kurogane defended the Spider Clan on the dias, resulting in a challenge to a duel to the death. This challenge was lost, Kurogane died dueling with Aizawa's champion, Hiruma Tetsuya. Kurogane continues to serve Emma-O after death, appearing at least once before those that interfered with his new Lord’s domain. He will not fail Emma-O, for his son's sake. Daigotsu Tsubaki was fostered into the Crane at a young age and after earning the respect of her hosts, she was allowed to train as a kakita bushi. As of this year, she was on loan back to her clan. Tsubaki spent much time fostering good relations with the Dragon Clan while diffusing animosity with the Crab. She even became the first known Spider to participate in a Crab Draw-lot play. A hopeless romantic, Tsubaki found an opening for marriage in the wording of the Spider's treaty with the Mantis. Upon reading, Tsubaki challenged Susumu Mizuki to a duel for the right marry Yoritomo Kyoju. Eventually, the feud resolved strangely in two duels where the losers, Tsubaki and Kyoju ended up betrothed with the right to govern East Hub Village. At the Devil's Chase, Tsubaki nearly uses the Damning Knowledge to defeat the oni bomb- but Saiga beats her to it. She races to the temple of the Dark Fortunes and begs Daigotsu mercy for Saiga’s soul.... and Daigotsu answers.... She strikes a bargain to save him and offer another soul within a year’s time or else damn herself. Tsubaki leaves opting to condemn no one and braces her soul. Born into the Daigotsu as the son of a Tainted bushi and unTainted smith, Kageto was watched closely to see which path he would follow. When Kageto was four, he was brought before Daigotsu Gyushi. Kageto sang a Colonial children’s song, and the fire kami responded by making the fire he was attending explode. Kageto was unharmed. Daigotsu Gyushi accepted the child into his vassal family, making certain the boy never tended a fire unless he was the sole smith present. For his gempukku, Kageto forged an awakened wakizashi. It was accepted by Daigotsu Kanpeki, and Kageto was sent to represent his family in Rokugan proper. Kageto’s role evolved at Winter Court, but remained challenging. More of a smith than a priest, he avoided speaking in the main court. He served the delegation as a weaponsmith to bring honor to the Spider, and became the Smith of Death after a visit by Emma-O. He was responsible for reforging the Fortune’s broken spear, and joined in with the Devil’s Chase. The Spider Clan hosted a contest of Shourido to win an awakened katana forged by Kageto. Kageto designed and forged a new style of yari for the Crane. A Daigotsu bushi who was granted fealty to the Susumu family, Susumu Asina had been born physically deformed. She was cured through mysticism of the Order of the Spider, and trained as a duelist while travelling the Empire. She was sent to the Winter Court to serve as a courtier and yojimbo, championing both Shourido and the Progressive movement. Originally the ambassador to the Phoenix, Asina became the personal yojimbo of Gyushi Kageto. Nominated for marriage into the Crane Clan, Asina fell in love with the widower Doji Yukihiro in a whirlwind romance. After the disappearance of Susumu Naishi, Asina became a prominent diplomat of the Spider Clan, negotiating a Spider fostering to the Leaf Cutter Dojo of the Lion and a descendant of Lady Asako to officiate her marriage. During the assault of the Oni, Asina sang alongside Susumu Yuna and fought alongside Toku Saiga. Asina helped end Saiga’s life after the sacrifice of his soul, and brought his wishes to be recognized as a Spider back to the delegation after his death. She also informed Iweko Miaka that Seppun Asagako was certainly slain by the oni, an admission made alongside an open show of grief for Saiga’s sacrifice. Abandoned as a child at the Temple of the Dark Fortunes Susumu Mizuki was raised to be a spy and servant of the Susumu Family. A witness to a plot that would lead to the coercion of Daigotsu Geiko into the Spider, she would reconnect with the bushi years later. She aided him in establishing an ikebana correspondence group that allowed her to keep track of him as well gather information from the various other “Scattered Petals”. Initially merely a support member of the delegation she would slowly grow in confidence as the Mantis clan diplomat aiding Yoritomo Kyoju in the deal for East Hub village. The scheming and plots surrounding the resulting series of challenges cause her to rethink her stances on love, duty and ambition and ultimately she ends up betrothed to her love Doji Minoru. After the disappearance of Susumu Naishi she becomes a more prominent court figure and clan nakado finishing several marriage arrangements including one that sends Geiko back to the Mantis. She would also establish the fake death of Susumu Naishi, being one of the few people to know of her former mentor’s continued hunt. The architect behind several of the Spider Clan achievements at Winter Court, Susumu Naishi is an Ide-born Spider by marriage. A skilled merchant patron, Naishi was also secretly known as the author Ki O Tsukete who wrote a series of pillow book detective novels. The mother of two young children, she served as a surrogate mother for much of the delegation. Naishi began court as the ambassador to the Unicorn and Lion Clans, but quickly took up the responsibility of Clan nakodo. Naishi was named also named the Spider karo after Kurogane’s death. Her efforts led to the rapid expansion of the Gyushi family, and the Progressive economic alliance. Naishi brought forward the petition for the Progressive alliance, and penned the document to be sent to the champions of the Spider, Crane, Mantis and Unicorn to be ratified. What few knew was that Naishi was also tasked with investigating the Kolat conspiracy by Susumu Kuroko. Having spent her life studying them, she worked tirelessly to root out their influence in the capital with the assistance of Susumu Mizuki, Kakita Ichigiku, Ifedayo, and Kistuki Miroken. Naishi disappeared after Day 25, faking her death and leaving the city to infiltrate the conspiracy. The Master of Guile is one of the more well-known Susumu in Rokugan, having gained a measure of fame from presenting the Blood of the Preserver to the second son of the Empress. As one of the most influential manipulators in the Spider he was the natural choice to lead the delegation this season. While his wife, Susumu Ayano, spent the winter in the Mantis lands where she gave birth to their son, Takada pursued the objectives of the Spider in the capitol city. He came to the Winter Court with two personal objectives, to prove that the Spider were a great clan of equal status to any other, and to claim holdings for the Spider on the mainland so that they were not reliant on the charity of the other clans. His ambition would lead him in a pursuit for the fallen city of Otosan Uchi. He is pleased with his successes in these matters. Takada soon became a feature on the Dais, addressing the concerns of the other clans, rebutting attacks, exposing weakness in the petitions of others and more commonly than not, sparring with the head of the Crab delegation Yasuki Tono. Susumu Yuna had grown up and lived a life where she was not accepted. In the eyes of her parents, she was too soft. In the eyes of others, she was the daughter of monsters. It made for a hard and lonely childhood, but also steeled her resolve to make sure nobody else felt as alone as she had. Coming to the biggest court in the Empire was a nerve-wracking experience for the young artist, and while she had been assigned to work with the honored Imperial delegation, her main focus had been watching over and improving the morale and opinions of the Spider. She began the “Unity” movement through this, making sure even in dark times when they would be tested, the Spider would remain focused on their goals together. When she wasn't doing that, she was singing in many places throughout the court, which lead to the Devil’s Chase. She first sang alongside Suzume Shindo to calm the peasants, before standing alongside her friend Susumu Asina and many others in the court singing a chant to draw the Oni back towards the temple and trapping it in its current form so others could kill it. The Monkey made the mistake of sending Toku Saiga, a known troublemaker, an invitation to Winter Court. Despite his reputation, he proved a friendly individual, making fast friends with the Spider delegation. Always an outsider, his acceptance around Spider brought him joy. These feelings were turned into hate for the Crab clan as an offense declared by Kasuga Aizawa forced Daigotsu Kurogane into a dual to the death. Taken by a murderous rage, the Monkey delegate was ready to charge at the entirety of the Crab delegation moments before the duel even started. Susumu Yuna stopped the warrior on his tracks with a single whisper: "Unity". Suddenly, the Spider delegation stood as one, repeating that word. Saiga was finally home. After declaring his intention to join the Spider Clan to Susumu Kuroko, she asked for him to impress her. Saiga pushed himself to his limit attending all shorts of courtly events. He did not obtain a single success for his endeavors. It was only when he gave his life to stop a mysterious incursion from Jigoku into the capital that he finally answered Kuroko's challenge. In his charred corpse one could see a smile on the dead man's lips. Kasuga Aizawa attracted the ire of the Spider Clan at Winter Court after an exchange of insults with Daigotsu Atsushi during the Winding Water Banquet. Atsushi insulted the Tortoise Clan, which Aizawa publicly claimed as an insult against the Empress herself. The Tortoise Clan ambassador reached out to the Emerald Magistrates, demanding Atsushi’s seppuku for this. At the conclusion of their investigation, a matter which Susumu Kuroko took a personal interest in, Aizawa was told that Atsushi’s insults were not directed at the Empress, but solely the Tortoise Clan. If he wished to defend his honor with a duel, he may challenge Atsushi. Since he demanded a seppuku, only death would suffice. Aizawa was promoted shortly thereafter to Crab Clan karo in court. During the Spider Clan petition for the recognition of the Gyushi family, Aizawa implied they were survivors of the purged Chuda family. For this insult, he was challenged in a duel to the death by Daigotsu Kurogane, the Spider Clan karo. This was a duel that Kurogane sadly lost, falling before the blade of Hiruma Tetsuya. With that duel out of the way, Aizawa sent his letter of challenge to Daigotsu Atsushi, choosing Yasuki Kyoko as his champion. Atsushi accepted the challenge, and arrived at the dueling ground eager for the fight. The match between Kyoko and Atsushi was bloody and brief. A kharmic strike left Atsushi only slightly injured, and he quickly cut down the Phoenix-trained Crab. Aizawa committed seppuku as a result. The worst enemy is the enemy inside. For most of this court, the Spider have been fighting their own demons. First, the Darkness. The Spider allied themselves with the Scorpion to fight its minions. Daigotsu Mori, a pure human trained in the old Goju ways, even lobbied for the Obsidian Magistrates to be cut of the Shadow's influence once for all, blade in hand. Next, the Taint. A difficult subject to say the least, source of many internal clashes, and even one on the Dais, which ended with Mori being exiled for having publicly advocated Jigoku. Despite their higher-ups' reluctance, a determined anti-Taint faction nonetheless rose from withing the clan. Gyushi Kageto swore to keep the Taint away of his family forever, as did Daigotsu Kurogane's father-in-law. Daigotsu Geiko advocated for the creation of a unit inside the Spider proper dedicated to pursue evil users of the Dark Power. Which ended in many teeth grinding, but also in a lot of outside support. And no explicit clan rebuttal. Yet. And from Geiko's researches and Daigotsu Tsubaki's experience, it appears the ascension of Daigotsu and the Dark Fortunes eased the process allowing for one to be purged of the Taint, their divine will bending the old and new rules. Maybe this is a game from the Dark Lord, a simple trick to make the corruption look less harmful. But it may also be a beacon of hope. For the Spider. For the Empire. Having challenged Kasuga Aizawa to a duel to the death, Daigotsu Kurogane sought simple blessings for his swords. As it would be improper to have an outsider perform the blessings, he approached Daigotsu No Gyushi Kageto at his forge on a cold winter night. The beginning of the blessings were typical, calls to the kami of the swords to stand fast and calls to the fortunes to protect and guide. However, someone else was watching that night and He was none too happy to have been left out. The room grew even colder, and a thick grey mist heralded the approach of Emma-O, Fortune of Death. The fortune was disappointed in these prayers, disappointed in the supplicants, and demanded his rightful due from the two Spider. Gyushi Kageto offered his craftsmanship to the Fortune, swearing that all weapons forged by the smith and his descendants would bear the mark of Emma-O. This pleased the Fortune, and he turned to Daigotsu Kurogane. The monk had no craftsmanship to give, and so he gave the only thing worthy of the fortune. His service, eternal. Should Kurogane succeed in serving the fortune, his descendants would bear the blessings of Meido and Emma-O. But should he fail, the fortune would take every last one of them as his own after death. Kurogane died in the fateful duel, but he yet serves in Meido. He will not fail, for the sake of his son and all those that come after. On the evening of the Devil’s chase, Daigotsu Tsubaki had been one of the many souls who fought the oni that rampaged through the streets of the Imperial Capital. Courageous beyond measure, she literally chased the Devil through the streets with 20 Spider warriors at her command. She also held the Damning Knowledge that allowed one to end a threat of Jigoku at the singular cost of their own soul. But a mere moment from the strike that would end the creature’s menace, and herself, Toku Saiga beat her to it, sparing all and sending his own soul to the Jealous Realm. Tsubaki was at once terrified at the prospect that her friend was damned. She thought her own soul was the one best prepared to resist Jigoku’s power and the belief flooded her with guilt. She ran to the Temple of Dark Fortunes and begged Daigotsu to spare Saiga the wrath of his realm. Treading the path of both bushido and shourido, Tsubaki gathers her will, recalls her knowledge and appeals to Daigotsu’s compassion for those who dared to be more than what The Celestial Order dictated them. Daigotsu grants her request under the caveat that she must sacrifice another soul to the jealous realm in Saiga’s place or else be claimed herself. She is granted no choice. Tsubaki later recounts the story to Kuroko and the other delegates. Geiko is briefly tempted to settle her curse with violence, but after some persuading, grants her assistance instead. At the beginning of court one of the major desires of the Spider delegation was raising the status and glory of their new nominally untainted shugenja family, the Gyushi vassal family of the Daigotsu. The earliest victory on this track was having Gyushi Kageto a member of their delegation as a suitor for Tamori Touya. Despite the odds he won the heart of the Dragon shugenja. Susumu Naishi took the idea one step further during a treaty negotiation with the Unicorn Clan, asking for a single shugenja to join the Gyushi family as a sign of support. Ide Doburu increased this to a dozen Meishodo-trained Unicorns. With this outpouring of support from their allies the Spider delegation used their second petition to ask the court for the Gyushi to be formally recognized as a great family within the Spider. This drew a great deal of ire from the Crab delegation, resulting in a duel between the two delegations’s Karo. Hearing on that day the outpouring of support from the Unicorn spured the Dragon clan to not only match the Unicorns offer but formerly announce the marriage between Kageto and Tamori Touya. Not wishing to be left out the Mantis clan promised some marriages as well. Sadly the Gyushi were not recognized that day, but the Regent herself conceded that Gyushi would create a sword for the next Emperor and the position of an Imperial Armorer to the Gyushi family. Susumu Asina was part of the luring out of the Oni on top of the Temple of the Seven Fortunes. She sang the words from the Devil’s chase song with Susumu Yuna surrounded by shugenja. She prayed to her lords and the dark fortunes and was one of the first to realize what would stop the beast. Realizing what would halt it, she shouted it loud and clear and then explained clearer to Toku Saiga. Saiga then read through Kurogane’s book, accepting the Oni. Asina had read the same words and was about to do so herself. Instead, she had to turn and kill her friend. Both this and the forceful blow from the event made her cry openly on the rooftop and her eyes go red for the rest of the day with the anger and sorrow she felt. Asina then tried to speak with Iweko Miaka about Saiga, but the Miharu ordered everyone away. At this point, she went to the streets and found Doji Yukihiro. Together, they went back to the rooftop with eta and removed Saiga’s body and Kurogane’s book. They took Saiga back to the Embassy, where she decapitated Saiga and had his body burned. The others of her delegation joined her later and Bayushi Norimassa toasted to Saiga. Saiga was declared Daigotsu Saiga at the cremation and Asina learned of Tsubaki’s deal with the Dark Fortunes. Tsubaki stayed comforting Asina, until Asina left for the Crane embassy with Yukihiro, where they stayed the night. Susumu Mizuki and Yoritomo Kyoju worked out a deal which would result in East Hub Village along with a number of trading ships to be transferred into the Spider under his command as Governor and admiral. Kyoju requested Mizuki as his bride. Unfortunately, Mizuki had recently made contact with her first love, Mirumoto Shou, whom she had long ago broken ties with. Shou turned to his own clan nakado and requested to marry Mizuki as well, tied to the offer of hakanai. To provide Mizuki options and preserve both deals, Susumu Naishi worded each trade pact to feature Daigotsu Tsubaki as an alternative betrothal. During the final negotiations of the Mantis deal, Kyoju determined he would rather have the more fearsome Daigotsu name, and asked to marry Tsubaki instead. A livid Mizuki managed to work her way back into the deal hours before the treaty was presented before the court. Shou challenged for her hand, but backed down after Kyoju intimidated him, insulting Niten in the process. The Dragon in turn demanded a death duel against Kyoju for the insult, which was denied by the Mantis ambassador. Instead, Kyoju’s second child was offered to be raised by the Mirumoto. Tsubaki also challenged Mizuki for the right to wed Kyoju, ultimately losing. Mizuki tired of Kyoju’s conniving, and permitted her current lover Doji Minoru to challenge successfully for her hand. Kyoju would marry Tsubaki and Minoru would marry Mizuki, gaining the Spider Clan a city, a fleet, and two prominent samurai. Susumu Naishi had been selected to attend the Winter Court by Susumu Kuroko for her knowledge of the Kolat conspiracy. Naishi’s father had been a member, and his murder had led to her discovery of the conspiracy. During court, Naishi quickly reconnected with Kitsuki Miroken, the magistrate who had investigated her father’s death and inspired her fascination with the Kitsuki Method. Naishi also befriended Kakita Ichigiku, who had been a fan of her novels. With the assistance of Susumu Mizuki, Yoritomo Mikaru, and the ronin Fukumiwarai, Naishi had investigated a series of accidents in the marketplace with ties to the conspiracy. Feeling presence of her enemy, Naishi took steps to protect her son, Susumu Nori, from their influence. She gave a book containing all her knowledge on the conspiracy to Ichigiku and arranged with Miroken for her son to be fostered to the Dragon. Naishi was summoned by Mikaru to the Imperial Library the night of the fire, and helped Bayushi Norimasa defeat the shugenja responsible. Doing so revealed Fukumiwarai as a sleeper agent, and Naishi revealed her own knowledge of the conspiracy. The Scorpion monk Ifedayo later confronted Naishi in private after learning of this, and Naishi agreed to aid his efforts in stopping the conspiracy. Naishi and Miroken were present during the assassination attempt on the Voice, and Miroken died saving Naishi’s life. Naishi escaped the collapsing warehouse only to be captured herself. Her captor was revealed as Soshi Kaoku, who allied with Naishi to infiltrate the Kolat. Takada’s personal objective this season was claiming mainland holdings for the Spider. Though seemingly impossible, Takada set his sights on the cursed city of Otosan Uchi. After the Kasuga talked himself into a position where he admitted his clan had failed in their duty there, Takada sprang into action. He approached each of the Delegation Heads he considered allies. His initial push gathered surprising support, with each willing to consider Spider stewardship of the area, under certain conditions. The biggest coup came from the Imperials, who agreed to present such a petition, with their endorsement to the court. Then, overnight, everything changed. Perhaps Takada had underestimated the gossip of the court, perhaps he had failed to intercept the movements of an enemy, or perhaps a voice from the heavens reminded everyone what Otosan Uchi meant to the Empire. He found resistance where there was none previously and the goal started to slip away from the Spider. The Clan altered their approach. Taking Otosan Uchi would be a long term goal. Instead, Naishi completed a treaty securing East Hub Village, and from that foothold the Spider worked towards a petition that would have them attempt to cleanse the former Capitol of its curse. It is unknown if such is possible, but they alone among the Great Clans are comfortable living in such a tainted place. For now let the Clans become accustomed to a Spider presence while they combat the darkness there. The city will one day belong to the Spider. Toku Saiga wished truly to become a member of the Spider Clan, and was willing to do anything to achieve it. What nobody expected was for this to be paved by an oni. 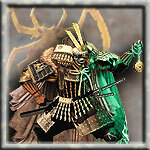 During the Devil’s Chase at the end of the Winter Court, an oni appeared and attacked the Imperial Princess. The samurai of Rokugan defeated the monster, but it would not stay dead. What they were not aware of was the Oni carried a tie to Jigoku itself within it, restoring it to full strength every time it would be destroyed. If it was not stopped, it would form a fresh Festering Pit to Jigoku. Warned that trouble was coming by Kuni Tomokazu, Saiga tried reading Daigotsu Kurogane’s journal to try to understand what was happening. Saiga’s ambition and despair reached Kurogane’s spirit in Emma-O’s service, and Saiga learned of the oni’s tie to Jigoku. Saiga learned he could bind the incursion to a living vessel, ending the incursion with the vessel’s death and rendering the oni killable. Uncaring of the specifics, Saiga performed the ritual on himself, damning his soul in the process. With the spiritual incursion bound to his body and soul, Saiga prayed to Daigotsu as he was cut down by Seppun Teshan and Susumu Asina. In death, Saiga prayed to save Toshi Ranbo and be accepted as a Spider. I am curious - did you actually get specific orders from Kanpeki (or Kuroko, on his behalf) regarding the Otomo? Or were you just assuming that he would want you to support the Otomo out of familial loyalty? We had the goal to conclude an agreement with the Imperial families guaranteeing us two permanent positions in the bureaucracy. We got the clarification that any such agreement had to be approved before the dais for it to count. Since we completely failed that goal ("I award you 0 points, and may God have mercy on your soul. "), I figured the best way to spin it to Special K was to be combative and aggressive. Oh, right, you did have that. It does seem very strange that positions gained by any other means did not count... but hardly the strangest thing that happened this winter. And yeah, that is probably the best spin you could put on it. "Item the fifth: the Crane Clan shall support the Spider in seeing two of their best and brightest given the opportunity to serve the Empress through Her Imperial Bureaucracy." Are these character profiles canon outside of WC4? Because they're really cool and informative. Honestly? Consider them semi-canon, from what I have seen. They are basically more like guidelines than anything else, and it will be up to the Story Team to see how canon these become. Some details (Atsushi's training by Sahara, Gyushi Kageto's whole school, Naishi being involved in the Library fire) have been confirmed by other sources as canon. For the rest? Wait and see is the only thing we have. Daaaaamn, were all your duels to the death? Interrupt: After you Recruit Daikichi, create a 1F/3C/3PH Mantis Clan • Spider • Nonhuman • Spirit Personality with the ability, "Engage: Enemy Personalities moving from or to the battlefield have -1 Force. Both of the official duels fought by the Spider (versus the Crab) were to the death, yeah. First was Daigotsu Kurogane vs Hiruma Tetsuya (Iweko Miaka's Secret Heart) over Kasuga Aizawa's brazen slander in front of the dais (How dare he suggest the Gyushi came from the Chuda! ), which Kurogane lost. The second was Daigotsu Atsushi vs Yasuki Keirohime, acting as Kasuga Aizawa's champion after he broke serious protocol and challenged Atsushi in a duel to the death over an insult against the Tortoise Clan during the Winding Water Banquet (a drinking / poetry contest wherein it is explicitly stated that dueling ANYONE over what is said at this event is considered HIGHLY uncouth, as being drunk is an acceptable excuse in samurai culture for saying things you should not). Atsushi won that one, but lost the illegal duel to the first blood fought against her Unicorn true love a week later. Our duelists also had horrifically cold dice during the Iajutsu tournament. That wasn't Keirohime... that was Kyoko. Oh, yeah. Kyoko was the cheese-crab. Keirohime was the Crab who the Otomo daimyo made a political exile over her creepy obsession with Miaka. And then the Crab used her to seal a trade agreement by marriage to the Phoenix, if I remember correctly. Despite the phrasing of her exile specifying her not being able to be used for political deals for that season. Keirohime was the Crab who the Otomo daimyo made a political exile over her creepy obsession with Miaka. And then the Crab used her to seal a trade agreement by marriage to the Phoenix, if I remember correctly. Despite the phrasing of her exile specifying her not being able to be used for political deals for that season. Amusingly, we got around that one mostly by dint of pairing her with our almost equally politically toxic Agasha, and, in the formal presentation, not actually naming her. Yeah, marriage to Agasha Kyokuta is sufficient punishment by itself, I think. I never was certain whether Otomo Taneji was deliberately punishing Miaka for Keirohime's actions when he decided that her stalker should hang around in close proximity to her for the rest of her life, or if he made her life that much more unpleasant without even thinking about it. I was awake for that scene... Man... Keirohime... She wanted me before we started to join some kind of Miaka for empress conspiracy or something. Did we ever find out if she was a gm character or not? I like the subtle Takada jab about Doburu need more difficult assignments. I never thought about Doburu being a rising political threat to Takada but I should have played that up more. Might have been interesting. Now that the empire going to the spider I can't wait to see some of these characters again. Doburu went all in on the spider at the end of court. Interested to see if he appears in the dark empire along side the majority of the characters. He was on the fast track to power, but he just wanted to keep his beloved and himself safe. Dammit I was at the Greeley Kotei with the 11 carls of death and that was the one question I forgot to ask. I hope we get to see some of you cutesy Spiders in fictions.